It’s soccer time once again, but this time we have a new participant. Izzy has thrown her cleats into the fray. 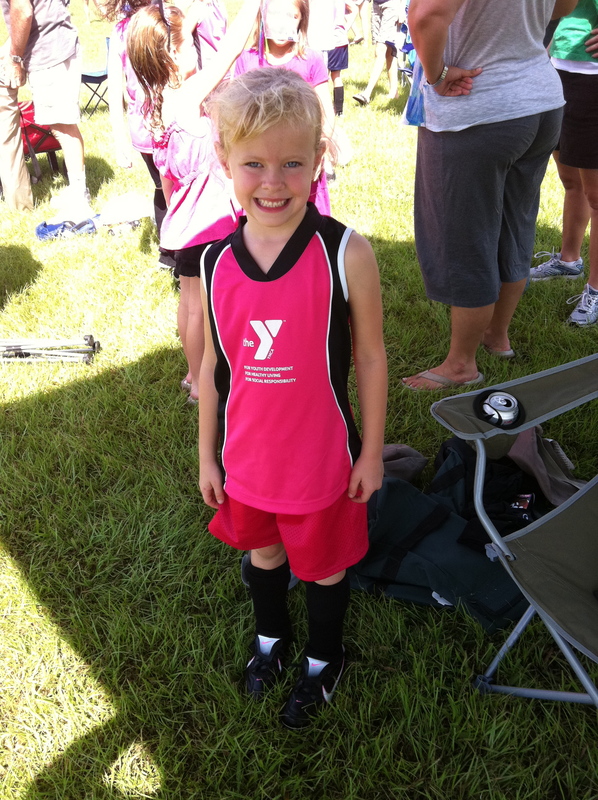 After years of watching Emily play, she wanted to get onto the pitch too. What’s amazing is that Emily and Izzy are actually in the same division. It goes 6 – 8 years old with Emily moving up to a new division in the spring. In a typical big sister move, Emily refused to let Izzy be on her team, so they are on opposing teams. What’s cool is that they play different teams all year, but their last game is against each other. Abby and I spend our Saturdays analyzing the two teams and trying to evaluate who is going to win the final game. 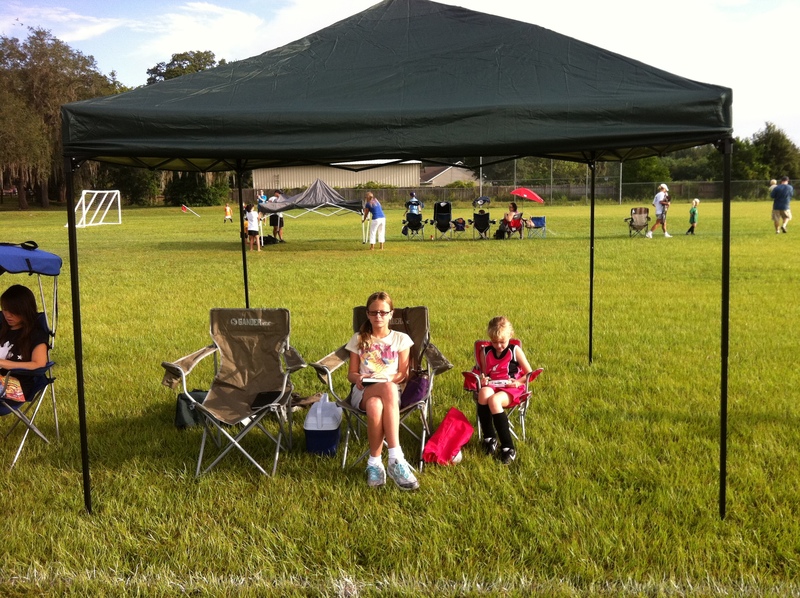 Because we sometimes have to spend three hours out in the hot Florida sun, we bought a canopy. Our first week we were out there from 9:00 a.m. until 12:00 noon. Emily was the first game, then we had an hour break before Izzy’s game started. We would have definitely burned to a crisp if we didn’t have it. Emily’s is looking great this year. Her team is currently 1-1 with a victory this week. Emily is playing offense now and she actually had 4 shots on goal, but none hit the mark. She’s still without a goal, but improving with each game. She shows incredible hussel, out running a lot of the other girls on the opposing team. Izzy is a work in progress. Hey, she’s only played two games. It reminds me of Emily’s first season. I keep telling her to “get in there” and to pay attention. She’ll get there. She looks so small out there, but her team is currently 2-0 and they beat the team Emily’s team lost to last week. Will Izzy’s team beat Emily’s team in the last game? Stay tuned to Frenchville in the coming weeks to find out. Once again it was time to use our Disney Vacation Club points. Last year we used them to go to Hilton Head, South Carolina. This year we decided to try a resort a little closer: Vero Beach, Florida. It actually ended up being closer than we thought: only an hour and a half to get here. Since the resort has a full kitchen, we started out vacation with a trip to Publix. We were going to already be spending money eating out and on various excursions. Better if we can eat a few meals in. The rest of the afternoon was spent swimming at the pool. The first night I walked across the street to pick up some pizzas from a local joint. Then, I hooked up my MacBook Air to the TV and we watched a movie over Netflix streaming. After the movie we headed over to an event that must be at every Disney Resort: campfire sing-along with s’mores. 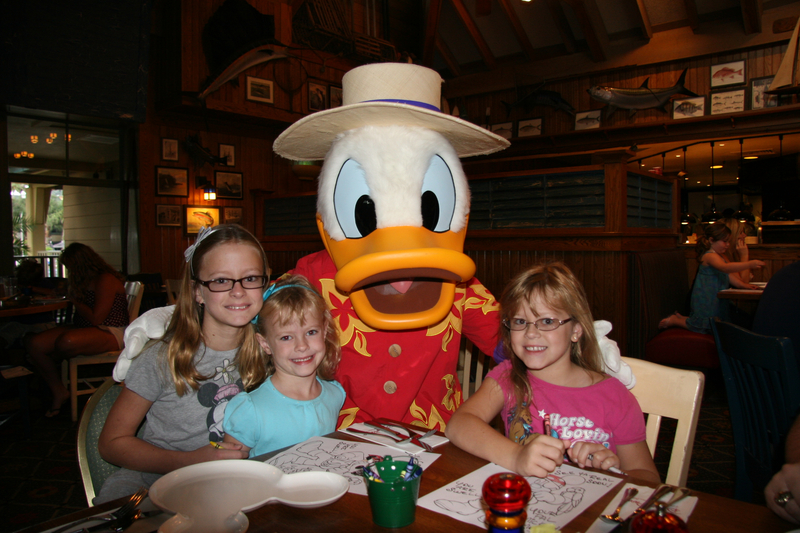 In the morning we had breakfast at the resort and we were accompanied by Donald and Goofy. I think the girls are officially getting too old for the Disney characters. Abby insisted that none of the characters should touch her on the head. The rest of the day was spent at the pool and lounging around the room. In the evening, we dropped the girls off for three hours of actives and dinner while Jennifer and I snuck off to have a nice meal.